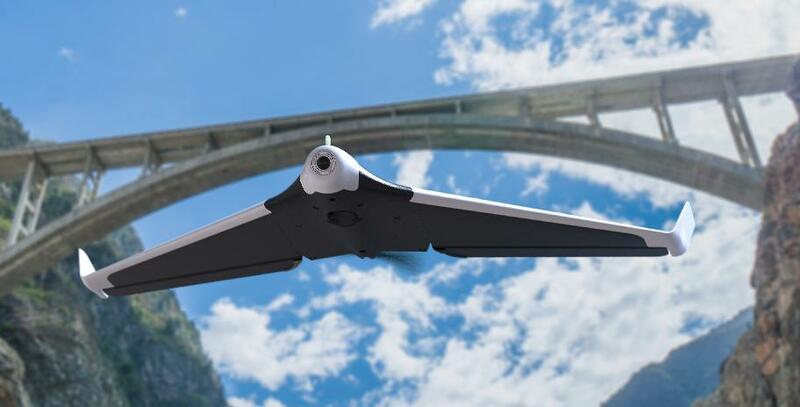 The Parrot Disco is a lightweight delta-wing with built-in camera and good flight characteristics. This page will help you get setup with ArduPilot running on your Disco. the file you need to download is ‘arduplane’. this will give you a file build/disco/bin/arduplane that needs to be installed on your Disco. The Disco has a builtin WiFi access point, which will show up on your network as “DISCO-xxxxxx” where xxxxxx is a device specific serial number. The WiFi has no password by default. You can also use USB networking if your operating system supports it. Just plug a USB cable into the left most USB port on the back of the CHUCK module and connect with your operating systems network manager. ArduPilot is usually installed in /data/ftp/internal_000/APM. You should use adb to create that directory and put a copy of arduplane from the build step in the directory. you may find the ‘Raw’ button useful for downloading that file. That script will start ArduPilot is there is a start_ardupilot.sh script in the APM directory. that starts the Disco FAN and then loops running ArduPilot. The loop is so you can restart ArduPilot with a MAVLink preflight-reboot request from your GCS without rebooting the Disco. The startup script assumes that your Disco appears on the 192.168.42.0/24 network for WiFi and 192.168.43.0/24 network for USB networking. It tells ArduPilot to announce itself as a MAVLink device on those two networks. It will pick up the first MAVLink capable ground station that connects on UDP port 14550 on those networks. They are all capable of controlling all aspects of the Disco setup and flight, including autonomous missions. The usual way to fly a Disco with ArduPilot is with a SBUS receiver and matching transmitter. You can also fly without a transmitter, but that is only recommanded for advanced users who are very familiar with automated flight control with ArduPilot. We hope to support the Disco WiFi based transmitter in ArduPilot in the future. The telemetry output option of many R/C receivers can interfere badly with the Disco WiFi. Make sure you do a R/C range check before flying and also check that your WiFi telemetry has sufficient range for your needs. Many R/C receivers with a telemetry option can disable the telemetry when binding. Please refer to your receiver documentation for details. It is recommended that you disable receiver telemetry if you find your WiFi telemetry link from the Disco is affected by your receiver. You need to calibrate the compass in your Disco before you fly. This must be done with the hatch in place due to the magnetic catch on the hatch. Each GCS choice has an option to start a compass calibration. Please choose on-board compass calibration for your GCS and follow the prompts. Note that you may find you need to raise COMPASS_CAL_FIT to allow successful calibration of the Disco, as the magnetic setup of the Disco hardware is not ideal and won’t produce a perfect fit. We recommend setting COMPASS_CAL_FIT to 20. You also need to perform an accelerometer calibration. Please follow the prompts in your GCS for the accelerometer calibration procedure. This will only need to be performed once. Before each flight you should perform an airspeed offset calibration as the airspeed sensor will vary in its zero value between power cycles. You should loosely cover the pitot tube that is built into the power switch and choose the pre-flight airspeed calibration option in your GCS. Next you should check for correct transmitter control with the Disco held level. pull back on the pitch (elevator) stick on the transmitter. Both elevons should go up. push forward on the pitch (elevator) stick on the transmitter. Both elevons should go down. Always launch into the wind, and be careful to keep your hand clear of the propeller. Also note that you can configure Disco for “shake to start”, to start the motor when the airframe senses a shaking motion. That is set by the TKOFF_THR_MINACC=4 parameter in the parameter file linked above. For general stabilised flight FBWA mode is recommended. This is also good for takeoffs and landings. For longer distance FPV flying CRUISE mode is recommended as it will hold airspeed, height above ground and ground course. You should also setup your transmitter for easy access to RTL mode to bring the plane home if you need to. To land manually FBWA mode is recommended. Just point the plane in the direction you want to land and drop the throttle. To come in more steeply push the pitch stick away. To perform a nice flare pull back a small amount on the pitch stick just before touchdown. APM:Plane will automatically put the nose down a couple of degrees when at zero throttle to keep the airspeed up. You can set how much nose down it uses at zero throttle with the STAB_PITCH_DOWN parameter. Make sure you land with zero throttle or you risk breaking the propeller. When using an AUTO mission you can place a NAV_LAND waypoint where you want to land, with a target altitude of zero meters. You also need to place an approach waypoint about 200 meters before the NAV_LAND point, about 30 meters above the ground. The Disco will automatically flare and cut the motor as it approaches the landing point. Note that the Sonar used on the Disco for landing flare detection does have a tendency to sometimes produce false positives. That can cause the Disco to flare early in the landing as it thinks it is close to the ground. Because the Disco has such good glide characteristics this doesn’t result in a crash, but it does cause it to land well short of the target position. There are two types of log files for the Disco with ArduPilot. The first is a “tlog” which is stored by your GCS software on your ground station. The second is a “DF” log, which is stored on board the Disco. The log directory is /data/ftp/internal_000/APM/logs and can be accessed by ftp. Just enter a URL like ftp://192.168.42.1/ in Windows Explorer if using Windows to view the storage on the Disco and access log files. These files have a “.bin” extension (for binary log file). The heart of the Disco is the C.H.U.C.K autopilot, an orange box which is a general purpose autopilot. It is perfectly possible to use the C.H.U.C.K in a different airframe.